A comprehensive reference set of Petrology classes. One hundred examples of the most common types of igneous, sedimentary, and metamorphic rocks from North American localities show the distribution of different rock types throughout the continent. The large sample size provides easy viewing of individual characteristics. The included 108-page manual contains detailed information, including microscopic and megascopic descriptions, for each specimen, plus name, locality, and geologic background. The set is housed in individual, labeled plastic trays. Contents:100 numbered samples, 3×4". Rocks: Igneous (43), Sedimentary (27), Metamorphic (30). 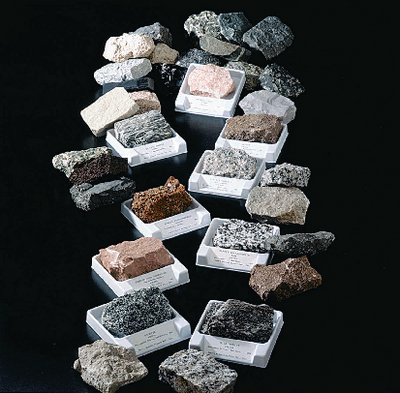 Classic North American Rock Collection, Student Set contains the same 100 rocks as in the Classic North American Rock Collection, in a smaller sample size ideal for individual study or for making thin sections. The set is housed in two fifty-compartment collection boxes and an identification list is included. Contents: 100 numbered samples, 1×2". Contents: 100 numbered thin section glass microscope slides, 27×46 mm. Classic North American Rock Collection with Matching Thin Sections is a complete set of specimens and slides at a special value. The same 100 rocks as in the Classic North American Rock Collection, plus 100 thin sections corresponding to each rock. 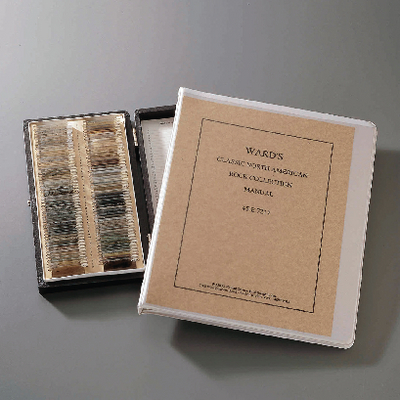 Contents: 100 numbered samples, 3×4", 100 numbered thin section glass microscope slides, 27×46 mm. Caution: Due to the nature of this product it may contain asbestos.